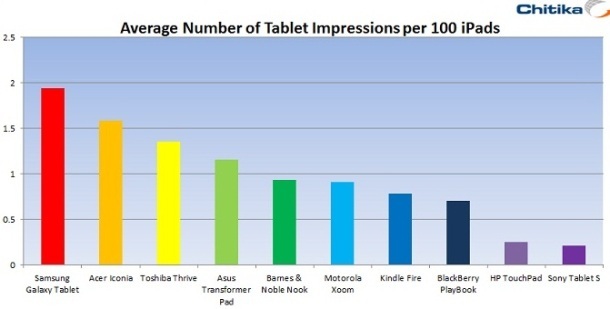 Right now it is safe to say that the iPad is on top when it comes to tablets. I’m assuming nobody genuinely thinks anymore that the Kindle Fire was ever about trying to bring down Apple’s device. It is no surprise then that in a recent analysis of their web traffic impressions, the Chitika Ad Network found that 91% of tablet traffic on the web comes from iPads. What does this mean for the two devices? Unfortunately this data is hard to draw any real conclusions from. Lacking any sort of information about data collection, we don’t even know as much about what devices we are talking about. How much of the Nook’s internet presence comes from people running rooted tablets thanks to simple tools making use of the SD slot, for example? That matters, since it is essentially a lost customer for B&N when they are selling their hardware at near-cost in order to lock people into their ecosystem. Even if we assume that those users are completely removed, we are still left with a study that examines only web use. Anybody who has spent time browsing the internet on either of these devices already knows that while pleasant enough for what it is, the browsing experience a 7” tablet offers will generally fail to impress. I would be more excited to see information about impressions and click-throughs on advertising in popular apps across multiple platforms. That would be likely to give us a better understanding of the comparison since just about everybody loads up some Angry Birds or Words With Friends from time to time. With the iPad still providing about fifty times the traffic of its closest competition this is all really a minor point. You just can’t expect a small device designed for media consumption to do the same job or generate the same interest as Apple’s more powerful and popular product. They have nothing to fear from Android tablets in general right now, let alone the budget side of the market. Clearly this data will be helpful for anybody who is interested in trying to target tablet users specifically when designing a web-based advertising campaign. For the rest of us, however, there is not enough detail to be worth thinking too much about it. It would be nice if the Nook Tablet suddenly experienced a huge boost in popularity since Amazon couldn’t help but push back by adding new products or software features, but that isn’t necessarily the case here. Maybe the next generation of tablets, with Windows 8 competing against the iPad and a Microsoft-backed Nook line providing intense competition for the Kindle Fire, but for now things are pretty much on hold. 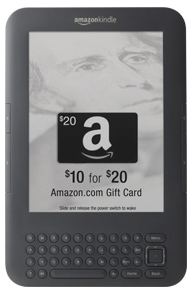 Does the Ad-Supported Kindle Go Far Enough? There have been a wide range of responses to the announcement of Amazon’s new ad-supported Kindle release this past week. For the most part, people seem to approve. Amazon made a smart move when they decided to have the ads be unobtrusive and potentially personalized. This leads me to wonder what the future holds as far as advertising subsidized eReading possibilities. Let’s face it, it’s impossible to get away from ads on a day to day basis. They’re all over the net, the roads, buses, walls, shipping containers…I could go on. How much do we really care anymore, though? The reason that this was such a great move for Amazon is that people are already so used to seeing ads and simply filtering them out without giving it much thought that this small addition won’t have any major effect. It isn’t as if they were being placed in such a manner as to interfere with immersion while reading, after all. I wonder how long it will be before we can get books with the same advantage, though? Obviously, some people have already caught on to the potential and made a business model out of it (WOWIO). It is demonstratively possible, therefore, to have an unobtrusive advertising presence in a book. Not really that much different from your average paperback’s large note that it has recently been made into a movie or television show, when you think about it. I’m really hoping this becomes a trend for the Kindle. While I don’t support the inclusion of ads mid-text, I think most people would be willing to glance through one or two as they flip to page one of a new book if that meant that the book was cheaper or even free. This could definitely work as a way to alter the existing Agency Model pricing scheme that makes eBook purchasing an almost comically overpriced experience from time to time. Give users the option of the normal book for the usual price, but a copy with ads included for 50% off. How many people will really turn down that opportunity to save money just because ads are obnoxious? I’m not advocating the WOWIO model, necessarily. I see this as having potential as a flag in the downloaded file that turns ads on or off on a case by case basis. This would allow for the updating of advertisements from time to time and avoid the problem of outdated messages. What would be the point of a sales announcement if you didn’t get around to seeing it until two months after the fact, right? 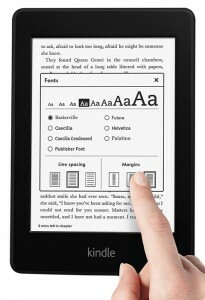 Still, the Kindle‘s new pricing due to ad inclusion is a huge step in the right direction. If, as has often been speculated, Amazon is selling their products at or below cost then something needs to be done to drive the prices further down. I know we’re all really hoping for those rumored free Kindles toward the end of the year, however unlikely the prospect.